A 54-year-old woman died Monday in a crash on the San Bernardino (10) Freeway in West Covina, attributed to her driving the wrong way, authorities said. The crash was reported at 2:56 a.m. on the eastbound San Bernardino Freeway at Citrus Avenue, California Highway Patrol Officer Tony Polizzi said. The woman was pronounced dead at the scene, Polizzi said. Witnesses reported the woman in a 1997 Honda Civic was honking at other vehicles as she drove slowly the wrong way, the CHP said. Both the woman’s Honda and the 2016 Mazda SUV she struck overturned in left lanes, the CHP said. The 30-year-old man driving the SUV, who was a resident of San Diego, suffered moderate injuries from the crash. 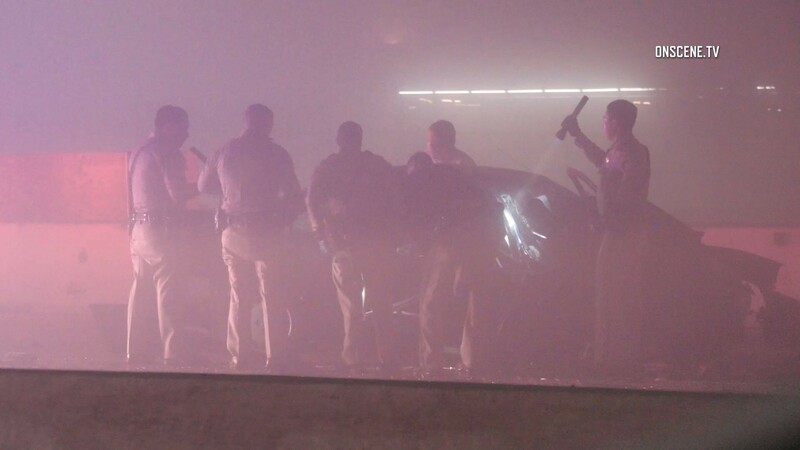 It was not known whether dense fog was a factor in the crash but witnesses described visibility difficulties, the CHP said. A SigAlert was issued at 3:17 a.m., shutting down all eastbound lanes at Citrus Avenue for the investigation, Polizzi said. One right lane was reopened as of 5 a.m. and all lanes were reopened at 5:45 a.m.